We’ve finally installed our new dishwasher! Hurrah! We’ve only had it for a few days, and it has genuinely changed my life already. Cooking new recipes every day, I create a lot of dirty dishes, and it’s so nice to be able to throw them straight in the dishwasher rather than letting them pile up by the sink. My kitchen instantly feels tidier, which instantly makes me less stressed. So yay for machines! When the robots take over the world I will happily hand them my dirty dishes. My dishwasher really has nothing to do with this mango chickpea curry, but I was too excited not to share. I tried to find some link between curry and dishes, failed, and in the end decided to just shoehorn it in anyway. So, changing the subject entirely… mango chickpea curry! 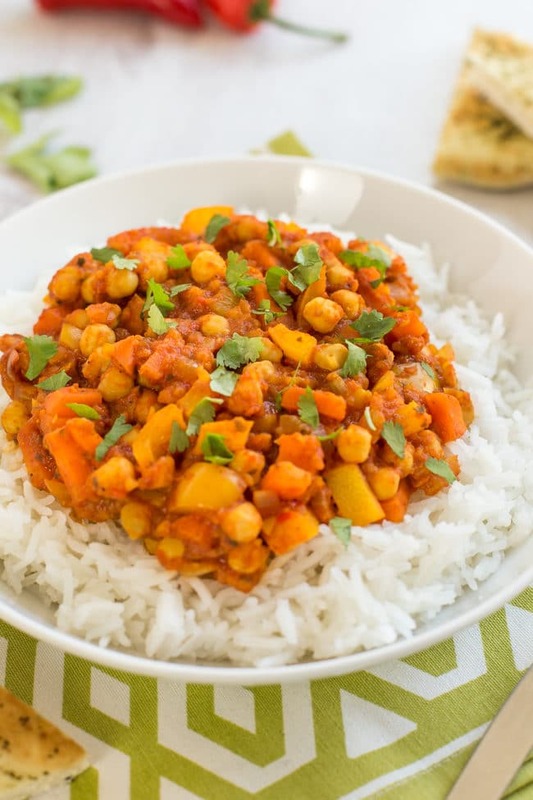 I realised it had been about 2 years since I’d shared a chickpea curry recipe, and since a good chickpea curry should surely be a regular feature in any vegetarian’s meal plan, I thought it was about time I shared a new one. 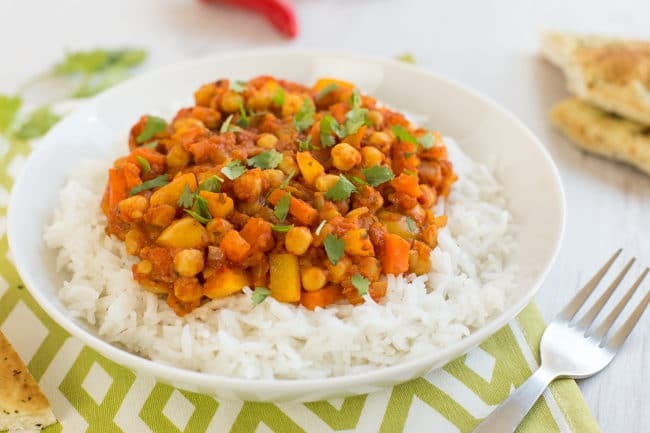 This mango chickpea curry is rich and slightly sweet, with a nice kick. My original plan for this curry was to use a dollop of mango chutney for sweetness. But in the end, I decided that using fresh mango would not only be much healthier, but it would also mean that I could nibble the last few morsels of mango flesh off the stone while it was simmering, which is always fun. So fresh mango it is. 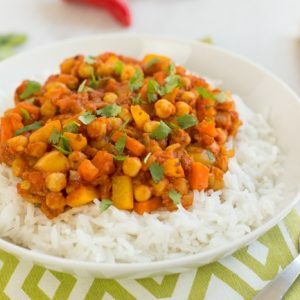 An entire mango (well, maybe 90% of a mango, after I’d had a nibble) is blended right into the sauce of this chickpea curry, which makes it extra fruity and juicy. You’d think an entire mango would make the sauce overly sweet, but actually the end result is surprisingly subtle – just enough to give a lovely flavour without making your curry feel like dessert (nobody wants that). Along with some red chilli, coriander and tomatoes, it makes an easy but really tasty curry sauce. As usual, feel free to use whatever vegetables you have on hand for your mango chickpea curry. I milked the orange theme, with a carrot and a yellow pepper, but anything will do. 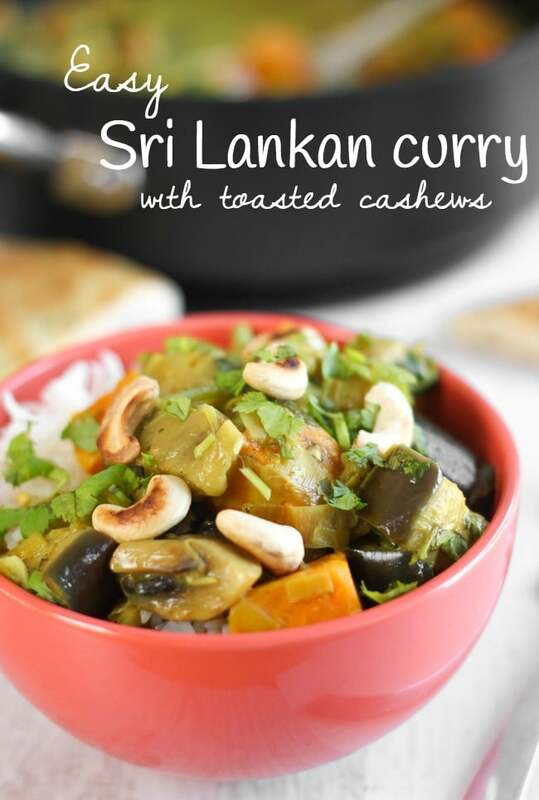 I really like recipes where you can just throw in whatever veggies you fancy – because if I can’t be bothered to go to the shops just to make a simple curry for dinner, I’m guessing you can’t either. Add the flesh of the mango to a food processor, along with the deseeded red chilli and fresh coriander. Blitz well. Add the tin of tomatoes, and blitz again until relatively smooth (a few remaining lumps are fine). Meanwhile, heat the oil in a large frying pan or wok, and add the onion, carrot and yellow pepper. Cook over a medium heat for a few minutes, until fairly soft. Add the drained chickpeas and the mango sauce, along with the curry powder, garam masala, tomato puree, and plenty of salt and pepper. Mix well, and bring to a simmer. Cook for around 10 minutes, until the vegetables are cooked to your liking and the sauce has thickened. Serve with rice and / or naan bread, if desired. I love that sunshine orange vibe going in this curry! I always add mango to my Caribbean curries but I’ve never tried it in an Indian dish. I’ll definitely have to give it a try. Your recipe looks just perfect for an easy week night dinner. Quick to prepare AND cheap. Brilliant! OH wow this looks freaken amazing!!! I just love mango this recipe is the perfect sweet and savoury! I will defiantly make this.!! Looks delicious and I bet the mango makes it so flavourful. Enjoy the new dishwasher! 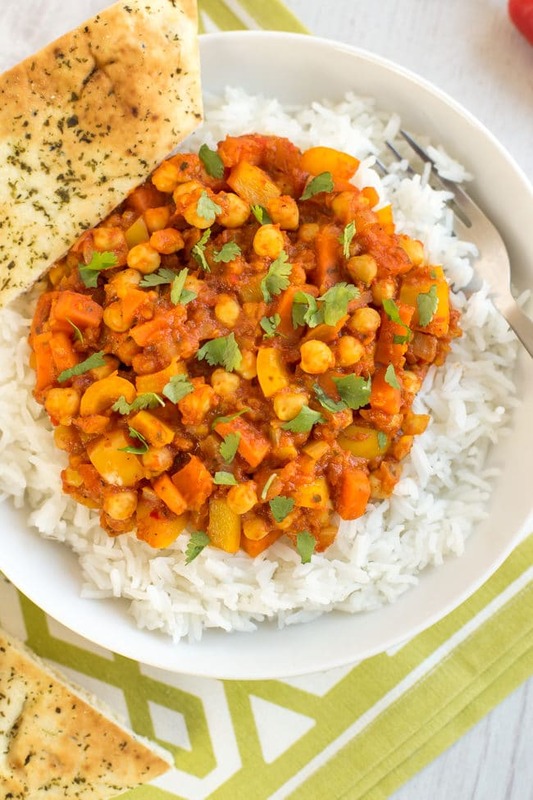 What a great twist on a veggie curry. 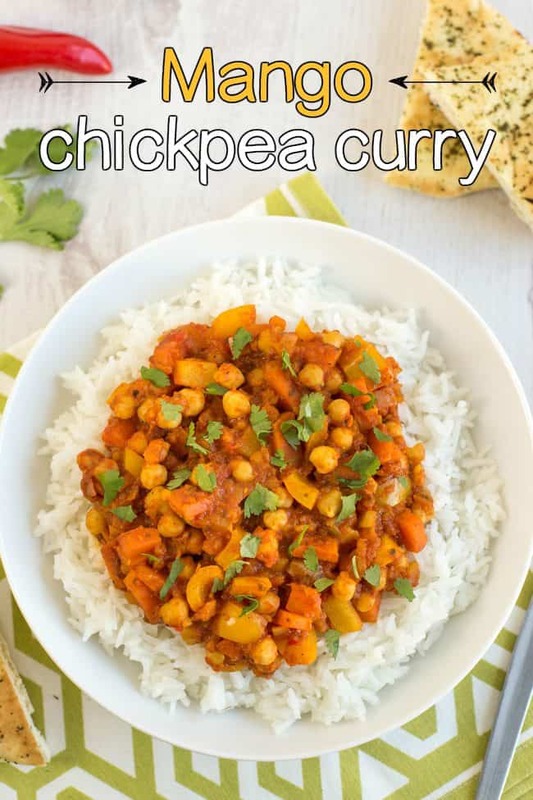 I love chickpea curries, but never put mango in them before. Great idea! Yum this sounds so fresh and full of flavour! Fresh mango would entice my kids to eat this too I reckon which is always good. And yay for the dishwasher, I still have pots to wash up but love mine too! This is exactly the kind of curry I love… especially when I’m feeling the chill like I am today. It must feel amazing to have a dishwasher again… I shudder when I remember when ours broke and we didn’t get a new one for MONTHS. It was torture! Haha I haven’t had a dishwasher in the 10 years since I moved out of my parents’ house!! So I am very much appreciating it! I know what you mean, I still don’t love fruit in a lot of hot savoury dishes, but it really worked blended into the sauce! We recently installed a 2nd dishwasher. .both 2nd hand,so total of £80..best thing ever. Never a single dirty pot on the side. I cook/make everything from scratch,including bread..and butter,so its definitely needed. It’s so handy isn’t it! Love having a clear worktop all the time. I bet having two is even more amazing!! Sounds yummy. Good excuse to nibble mango! Any excuse ;) I should buy it more often. I must try this. I recently ordered a curry with paneer and peas from my local Indian and was very disappointed, as it was horrendously sweet! The sauce was mostly coconut, I think, and it was not very nice at all! I mostly like food from that particular restaurant, but I won’t be ordering that again. But with fresh mango it sounds rather good….